“Yay! I did it! I have my Health Coach certificate! Then you NEED the Coaching Essentials Guide and Toolkit! The Crave Coaching Essentials package comes with step-by-step direction, helpful tips, real-life examples AND more than 30 worksheets and tools to help you conduct your client sessions with confidence. The Guide and Toolkit are exactly what you need to support your clients through the process of undoing unhealthy habits, retraining their brain, and changing their relationship with food. The worksheets help your clients become more aware. And that’s where your coaching truly makes a difference! As you know, awareness is the first step to creating lasting change. The Crave Coaching Essentials interactive worksheets will help you structure your sessions so that your clients gain a higher level of self-awareness and understanding of the root causes of their food challenges and health concerns. More than 30 worksheets and tools! Below are just some of the tools included in the Coaching Essentials Guide and Toolkit. We’ve also included completed worksheets from actual clients so you have real examples, and clear explanations about how to use each tool most effectively. How to use the Habit Loop worksheets! The Habit Loop worksheets help your clients understand their food habits and behaviors and give you a great jumping-off point to help them reshape their unhealthy habits into healthier routines. In order to best understand the relationship between your clients’ eating and lifestyle habits, you need to help them identify their “habit loops” – the cues that trigger their actions and the feelings they have before and after they “give in to” their habits. Then you can work together to discover how those habits were formed, how to avoid habit cues, and how to create new, healthier habits. While change isn’t always easy, with time and awareness (and with you as their health coach), clients can reshape almost any habit. The Coaching Essentials package comes with two Habit Loop versions, one for clients who crave sugar, the other for those who crave salty foods. Use the worksheet that best reflects your individual client’s habits. We’ve also included a sample of a Habit Loop worksheet filled out by an actual client, so you can see exactly how it works! 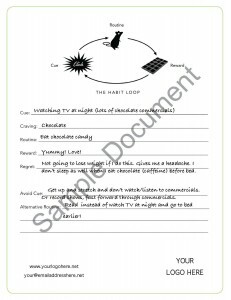 Click on the image on the left to see an example of the Habit Loop worksheet. 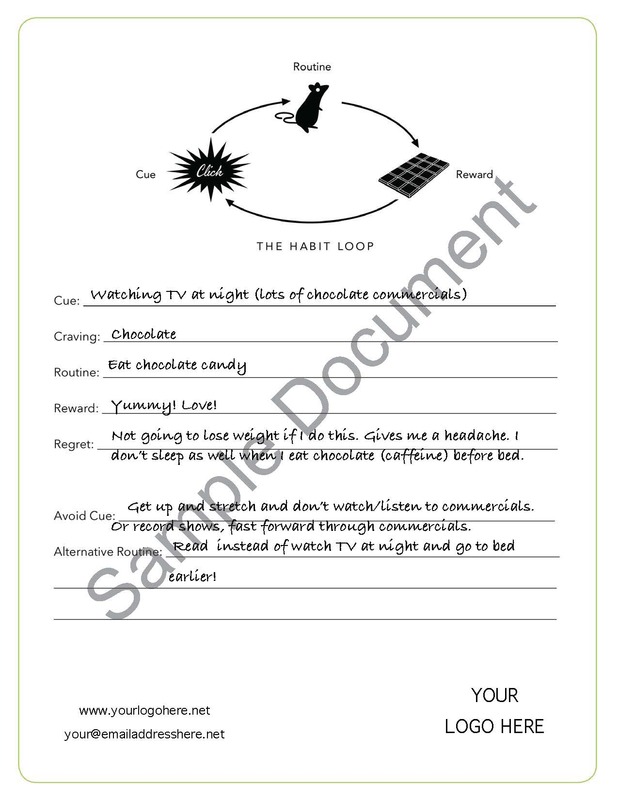 The Habit Loop is just one of more than 30 incredibly helpful worksheets, handouts and templates in the Coaching Essentials package! Order yours today and be confident, effective and successful! 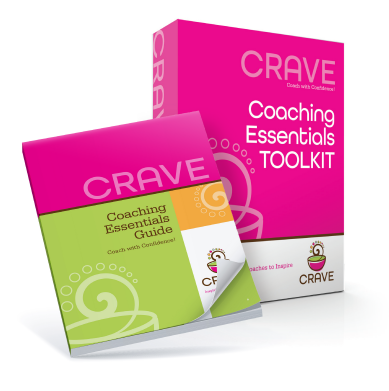 More about the Crave Coaching Essentials! In this 30-page Guide and Toolkit of more than 30 resources, Sandy shares her proven strategies and professionally-designed worksheets and session resources that made her health coaching practice a success! She’s done it all for you, so you don’t have to! How to conduct the Health History Consultation with purpose, direction and confidence so you don’t stress out and your clients sign up! How to get your clients started on the path to success right from Session One. See everything you need to know in the section, The Notebook! How to keep your clients motivated and on track with easy-to-follow session worksheets. Customizable with your name and logo! Exactly how to help your clients achieve those “aha” moments and guide them back on their path to success! Step-by-step coaching guidance so you know exactly how to conduct a Health History with confidence! THIS is the help you’ve been looking for! It’s the piece of the puzzle you’ve been missing! you’ve been looking for to take your health coaching proactive to the next level!